Ken Lamm of Huebert Builders Inc. helps guide a large metal cross sculpture into place this morning in front of St. Andrew’s Lutheran Church on West Boulevard. The sculpture was designed by St. Andrew’s member and architect Keith Westenhaver and crafted by metal artist Don Asbee in 1991. The cross was removed last fall for church renovations, which now are nearly complete, and was refinished by Advanced Ironworks in California, Mo. The stained glass windows in the Centrum were given in loving memory of Kenneth F. Struessel, MD, 1939-1977, by his family. They were designed by Dieterich Spahn, a specialist in liturgical arts, who was recommended to us by Edward Sovik, architect for the Centrum which was under construction at the time. 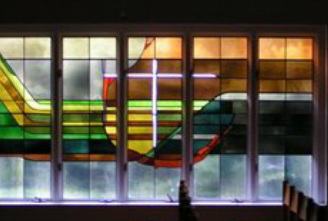 The east wall windows (the high side of the room) reflect Word and Sacrament, and on the west wall (opposite side), the theme of Father, Son and Holy Spirit. Spahn expressed the theme “Christ in the World” on the south wall (organ wall). The appearance of the simple cross, white in color, represents the Lord as the Savior over the orb of the world. A landscape with morning colors is on the left, moving to evening colors on the right.